I believe it is time to introduce another of my weaknesses: cook books. Are you noticing the pattern? I especially seem to gravitate towards the small promotional booklets found easily at flea markets and antique shops. 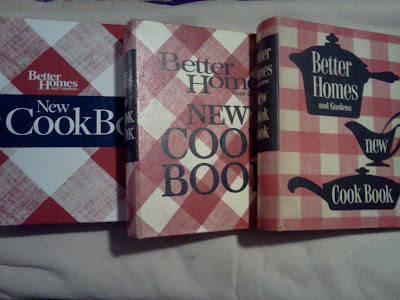 In addition to those, however, I also love the early editions of Better Homes and Gardens Cookbook. It had originally started with me picking up a new copy of the book after hearing such good things about it (pictured below left). The center book was the next I acquired. It is the 1968 edition, 4th printing in 1971. I found it about a half year ago at a small antique shop a couple towns away. It is in good condition, however you can tell that it was well used over it's life. My newest find from this past weekend is the lovely on the right. It's a 1953 first edition in amazingly good condition. I believe only two pages had broken free from the binder ring and the final page of the index is also missing. Aside from that, even the tabs only show minimal wear. I believe this may be my favorite book of them all...and not just because of the quantities and variations of Pyrex used in the illustrations throughout the book. You can see a notable emphasis on entertaining as well as a theme of fruity desserts in this book. I can't wait to try the recipes for Cape Cod Clam Chowder and Applesauce Cake. I also had a memorable experience while happily walking my new book to the check out. I was stopped by one of the older ladies who asked me about the book and mentioned that it was one of the best cook books she had. When another lady agreed with her, they both shared that they had received a copy of the book for their weddings in the early 60's. It strikes me as an awesome moment that this book crossed so many generations.